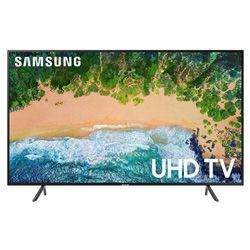 Samsung 50NU7100 vs LG 49UJ670 – what would be better for you? 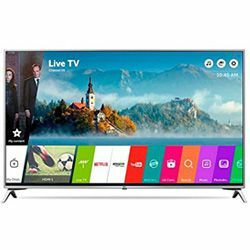 I wou ld like to share my experience after comparing and testing two solutions – Samsung 50NU7100 vs LG 49UJ670. Samsung 50NU7100 is from the NU7100 series and LG 49UJ670 belongs to the UJ670 series. These two series also include other reliable, modern TVs. Samsung 50NU7100 is a 2018 year model, while LG 49UJ670 was released in 2017. Both models belong to the mid-price range since they cost around $500. Samsung 50NU7100 uses the VA display and the Edge LED backlight technology, while LG 49UJ670 has the IPS type display and it uses the Direct LED backlight technology. These TVs support the modern 4K standard at 60 Hz, but Samsung 50NU7100 has the Tru Motion 120 technology that decreases image blurring during dynamic scenes. Both TVs output vivid colors, Samsung 50NU7100 uses such technologies as PurColor and Essential Contrast, while LG 49UJ670 uses Colour Master Engine and Active HDR. Samsung 50NU7100 uses the Universal guide technology to bring together the content from your devices and application in a single user-friendly application. It also has a simple and powerful searching engine to find the content you want. This TV can synchronize up to your smartphone. LG 49UJ670 uses WebOS 3.5 with a web browser and the voice recognition technology. This TV also has the local dimming feature. Comparing LG 49UJ670 vs Samsung 50NU7100 in terms of performance – both models are great – they work fast, without lagging or stuttering. Both models look alike – they have a stable Y-shaped stand. Both TVs are slim and you can wall-mount them. They have narrow bezels. The dimensions are 44.29x28.7x10.29 in for Samsung 50NU7100 versus 43.58x27.75x10.19 in for LG 49UJ670 (with the stand that is 2-3 in high). 50NU7100 has 3 HDMI and 2 USB ports – compare it with 49UJ670 that features 4 HDMI and 2 USB ports. Both models come with well-designed remote controllers. The picture quality is very high – the image is clear and colors are well-saturated (even the black color is dark). It has all the application you need, so you do not need to install anything. It doesn’t process movement correctly (you should consider turning the “Auto motion” feature off). It is easy to set up and use due to WebOS and its interface. Moreover, it has the applications you need. The built-in speakers' output clear sound. It has many video enhancement features. You may experience issues with the audio output (it is cut out) when you use certain services.